Formerly known as the Common Snipe, snipe that breed in North America are now considered a separate species called the Wilson's Snipe. This small, chunky, long-billed shorebird spends the non-breeding season in Tennessee. It can be found alone or in small groups across the state probing in mud and wet meadows for small invertebrates. However, its camouflage coloration is so good that it is often overlooked until flushed when it rapidly flies away in a zigzag pattern, uttering its raspy scaipe call. The Wilson's Snipe breeds across northern North America, and winters in the lower half of the U.S. south to northern South America. Description: This medium-sized shorebird, has a short neck, short legs, short tail, and a very long straight bill. It is colored cryptically with mottled brown and black, and prominent light tan stripes on both its head and back. Males, females, and juveniles look similar, and there is no seasonal variation in plumage. Voice: The flight call is a low, rasping scaipe or kesh. American Woodcock similar in shape, but lacks prominent stripes on the head and back, has a larger head and eye, is plain orange-buff below, and has more rounded wings in flight. Short-billed Dowitchers and Long-billed Dowitchers have longer legs, lack the stripes on the head and back, and have a white rump that extends up the back. Habitat: Forages on exposed mudflats, in shallow marshes and meadows, and along creeks and the edges of lakes and ponds. Diet: Terrestrial invertebrates, especially earthworms. 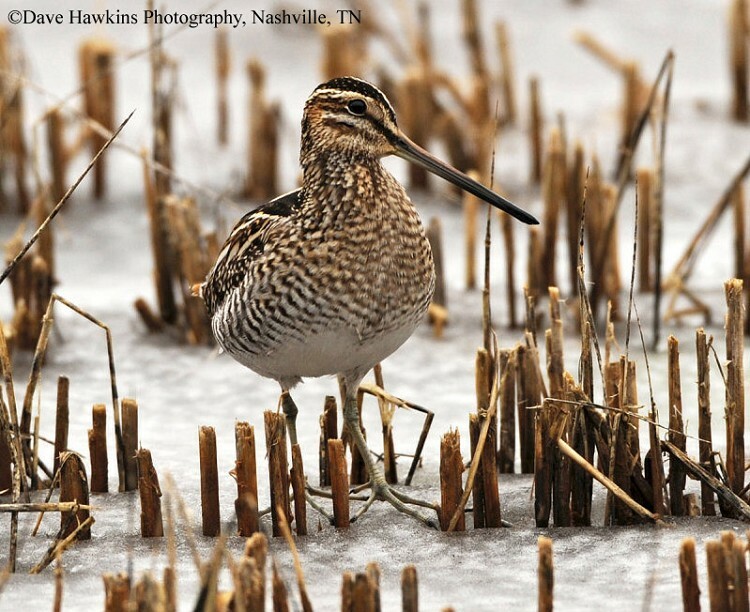 Nesting and reproduction: Wilson's Snipe has not been documented nesting in Tennessee. 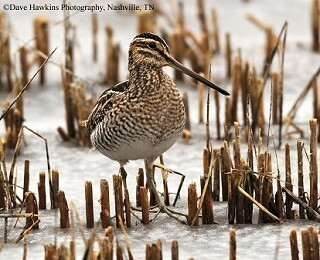 Status in Tennessee: Wilson's Snipe is a fairly common migrant and winter resident across Tennessee, present from mid-August through late May. This is a game species in Tennessee requiring a TN Migratory Bird Permit. The hunting season is usually in late November. The eyes of the snipe are set far back on the head, allowing full vision to both sides as well as binocular vision to the rear. This enables a bird to detect the approach of a predator even when its bill is fully buried in the mud. The snipe's long bill has sensory pits near the tip, a character shared with other sandpipers, which help individuals detect prey as they probe in mud for small invertebrates. Wilson's Snipe is a game species that is notoriously difficult to hunt. The term "sniper" for a sharpshooter started in the early 19th century and is based on its cryptic habits and camouflaged coloration. Best places to see in Tennessee: Wilson's Snipe may be found across the state in appropriate habitat from Reelfoot Lake in the northwest to Hiwassee WMA in the southeastern part of the state. Keppie, D. M., and R. M. Whiting, Jr. 1994. American Woodcock (Scolopax minor). The Birds of North America, No. 100 (A. Poole, and F. Gill, eds.). The Academy of Natural Sciences, Philadelphia, PA, and The American Ornithologists' Union, Washington, D.C.